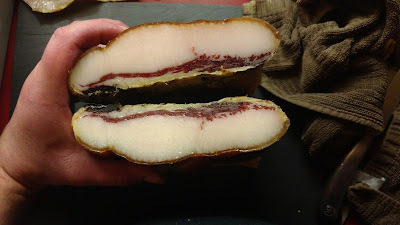 This is the end result of a Kunekune jowl that I started to cure last October, after Alana and Brian's Black Valley Farm charcuterie workshop. At just shy of 8 months of aging, I finally cut it open to reveal the beautiful dark red meat and glistening white fat. 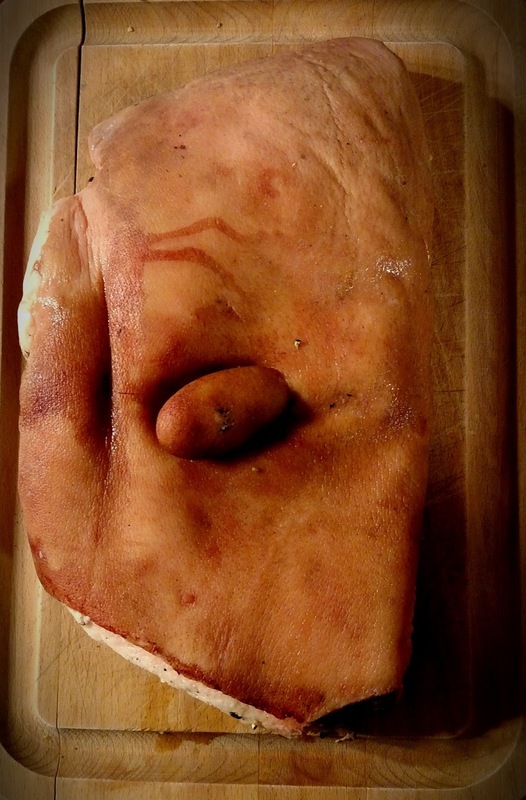 I left the hide on the jowl after it was butchered and cured then wrapped it in cheese cloth to hang and dry. Over time there was some yellowing of the fat, but that doesn't seem to have impacted the finished product. These Kunekune's were finished on windfall apples and these pigs were fat! Some people at the class seemed rather surprised, to the point of being dismayed, at the large quantity of fat on these animals. But for me it was a wonderful experience: heritage breed pigs raised on pasture, eating to their hearts' content on stray apples, traditionally culled in the fall. Plus, it's good to note the Kunekune is a lard pig, like the mangalitsa, and its fat is prized for cooking, baking, and (cleverly) Alana of BVF's traditional soap making. 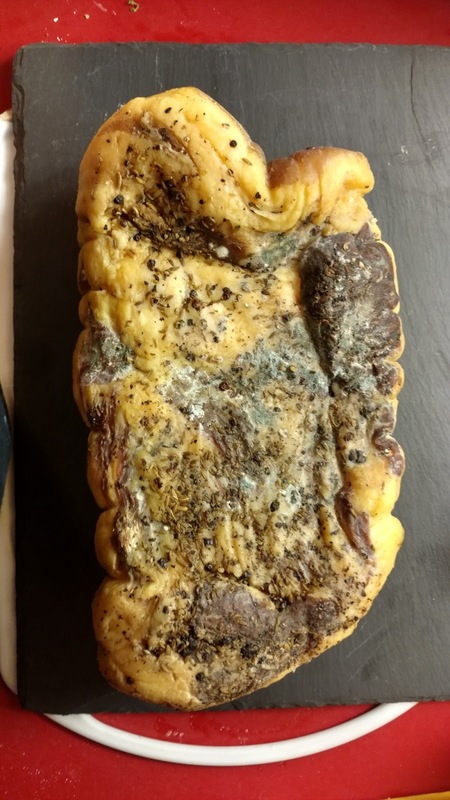 The jowl was cured in the Italian tradition of guanciale, seasoned with wild fennel from Craft Butcher's Pantry, along with black pepper, juniper, and a muscle flavor/aroma developing called Texel. 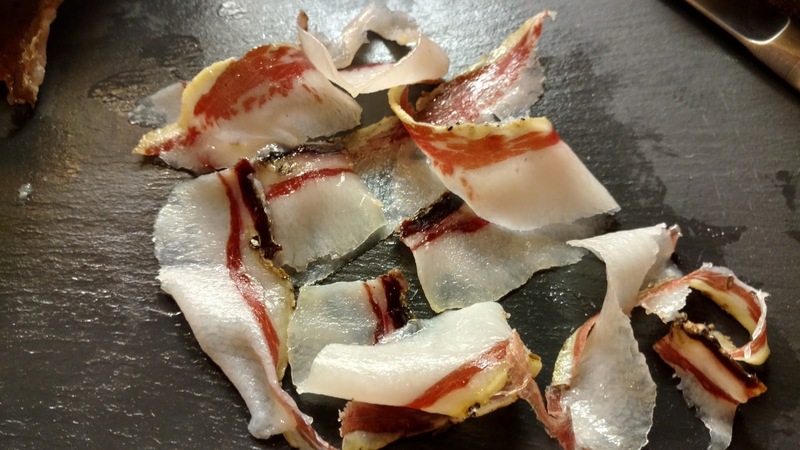 Texel has strains of bacteria which help to reduce levels of nitrites in cured meat, plus increases the savory aroma of the finished product. I really enjoy this guanciale sliced thinly and eaten out of hand or on bread. Carla enjoys it quickly crisped in a pan like bacon, then adding some sliced potatoes into the skillet with the drippings. A wonderful memory and a taste of last fall in every bite.